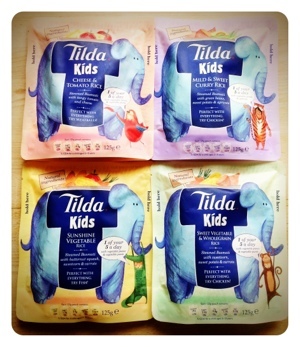 TheBoy was recently sent the new Tilda Kids rice range to try. This new range contains four, delicious, different flavours: Cheese & Tomato, Sunshine Vegetable, Sweet Vegetable & Wholegrain, and Mild & Sweet Curry Rice. They all sound very exotic and exciting for the average child's taste buds, but are all suitably mild in flavour so as not to cause an explosion on the tongue! Suitable for 3 years+, the range contains no nasties with natural ingredients used throughout. The back of the pack also suggests what they can be used to go with, for example the Cheese & Tomato rice will go nicely with meatballs. And because they provide 1 of your little one's 5 a day, they are a perfect accompaniment. Available in 125g pouches most supermarkets, they cost £1.15. As The Boy is only just three he has a half portion at a time, and for busy work days it is a perfect solution to dinner times. Even Nana approves, and you know you're onto a winner when that happens! We were sent these products for the purpose of this review. Our opinions are honest and unbiased. The Tilda Kids range of products are specifically aimed at 3-9 year old children as this is where our research was focused. Therefore, this age groups taste, texture, ingredient etc preferences are at the core of the range. However, the products are suitable for children older than 9 and younger than 3 years old provided they are fully weaned and happily able to eat solids. That sounds really nice, how come they're only suitable 3+? Is it the portion? These sound a useful addition to the food cupboard when you need a meal in a rush. I wonder why it is recommended for 3+ as I know Harry loves rice already. That's great, thanks! I'll be buying these! I'll be buying these then!! !